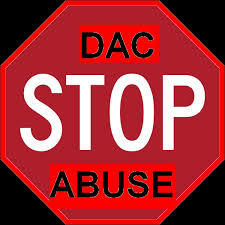 Stop DAC report abuse by employers. DAC Report abuse by employers placing false information on truck drivers DAC Report. How to stop it. Every day I receive e-mails from drivers who say they want to stop DAC abuse. They have had false information posted by their former employers and want to know how to have it removed. The first thing they need to do is stop whining about it and do something about it, because no is going to do it for you but you. Fred Schaffner from The American Driver.com says "Stand Up Speak Out Or Accept What Comes." In other word stand up for your rights or accept the consequences of doing nothing. The Fair Credit Reporting Act (FCRA) is responsible for overseeing DAC. The Fair Credit Reporting Act says that "A person shall not furnish any information relating to a consumer to any consumer reporting agency if the person knows or has reasonable cause to believe the information is inaccurate." If you can prove the information is false File a complaint with the Federal Trade Commission at this site. You can download the forms to do that here. Always send your letters by certified mail with return receipt requested so you can prove you mailed it in and that they received it. No one is going to do this for you but you. So start taking actions against these bad employees that are posting this misinformation. When these companies start get investigated by the Fair Trade Commission then they will stop putting bad information on peoples DAC. Trucking companies knowingly and willfully submit false reports to DAC Services against professional truck drivers for the sole purpose of ruining their careers. Furthermore, DAC will approve these false claims without any investigation or attempt in allowing the driver to respond. Although the driver can follow DAC's procedures for dispute, the ability to have the false accusations removed from their DAC report seldom occurs. companies very often report false claims to truck drivers dac reports. Why are trucking companies able to place a false report on a driver's DAC Report? (A) Reporting information with actual knowledge of errors. Do you have a DAC Abuse story you would like to share. You can leave your comments here all are comments are welcome.